We jammed a lot into the holiday weekend! Having an extra day off was really great and put me in a summer mindset that was really hard to leave, aka I did NOT want to go back to work on Wednesday! Fortunately the rainy weather since then has made it not so bad! But here’s how we spent our 4th of July weekend! We had our friends over Friday night and it turned into a really late night, keeping the kids out waaay past bedtime, but us grownups were having too much fun to say goodnight, our excuse “Its summer”! While we chatted on the deck we planned a super fun Saturday for everyone! We went to lunch at 12 Gates Brewery, which (despite it being a brewery) was a perfect place for kids, they had picnic tables outsides and lots of room to run around, and even some yard games! We got there right at noon when they opened so we were the only ones there for about the first hour. The absolute BEST part about this place is that its located right near the airport and the planes fly right overhead, which was awesome! It was a little scary for the kids at first, but they got used to it. We downloaded a flight tracker app so that we could see when planes were coming and give everyone a heads up. After lunch we headed back to our friends house to go swimming for the afternoon! Ada did awesome swimming in the big pool all by herself with just her water wings! On Sunday, we decided last minute to go up to Conesus Lake, where Dan’s family has a cottage, we go every year. I’m not a big fan of sleeping in a tent which is what has to happen when we go because there are so many people, but we decided to go up around dinner time, after Dan got out of work, and just stay for the fireworks then drive home. Ada got to go on a boat ride, which she has been asking to do since our Florida trip. she played with cousins and watched the fireworks. Again, it was a VERY late bedtime! Oh yeah, and our house officially went up for sale on Monday July 3rd! On the fourth our friends invited us to their house so the kids got to play all afternoon and then we walked to where the fireworks were and let them run around some more! It was a super fun weekend that we didn’t want to end! 4th of July is always my favorite holiday (better then Christmas) Its just feels like summer to me, we stay so busy but its always fun, relaxing things like swimming and campfires! How did you spend Fourth of July? Both our families were in town for Easter this year, we’ve had a few years where Dan’s parents were out of town, so we didn’t have to split our time, but this year we did a double day again! Ada has been counting down to Easter this year, she loves holiday’s and so we made an Easter chain about 2 weeks ago and she’s been literally counting down the days. I also wish we actually had people to our house during Easter, my table was looking so festive and springy! I colored Easter Eggs with Ada one night too, which she loved, it got a little messy but she loved mixing and matching the colors. I bought a marble kit this year, so the colors all blended together instead of turning into gross shades when you apply more then one color! On Saturday, I had found all these fun breakfast ideas on Pinterest and since most ideas I find on there turn into major #PinterestFails I was delighted when this one actually turned out pretty cute! Ada was super excited about it! Sunday morning she did her Egg hunt which she loved and keeps reenacting now over and over again, even as I try to keep hiding them away for the season. She also got a few new books, some bubbles, some painting things and her favorite, a new Moana Dress up costume. She’s obsessed with that movie right now! We had brunch with Dan’s family where Ada received a gigantic Easter egg filled with some goodies for outside, bubbles, chalk, a jump rope, and some other little things! And then headed over to my family for dinner. The weather started out not so nice that day, but it actually turned into a beautiful evening, so we sat on their back deck and let the kids (and dad) play in the yard for awhile to run off some of that sugar from the day! Hope everyone else had a nice Easter too! We are ready for summer to start now!! Happy New Year to everyone! Here is a pretty crappy photo of our sick family! We were all deathly ill over the last two days. We had to cancel the small New Years party we were supposed to host at our house. Instead we put Ada to bed early and Dan and I watched a movie on the couch until about 11:55, we toasted our water glasses at midnight and went up to bed. By far our most uneventful and depressing New Year’s ever, but fortunately this one happens once every year and we can try again next year! Hope everyone else had a fun New Years and from our family to yours, we wish you the absolute best in 2015!! Christmas is getting so close and it’s so much fun to do Christmas with a child, I keep talking up Santa Clause, hoping she gets it by the time she comes downstairs Christmas morning. She gets some things, like presents, although doesn’t quite understand what they are for I’m sure. She loves the Christmas tree in the house and all the lights. We’ve been busy trying to fit in all the usual magical holiday stuff. We took her to see Santa a few weeks ago at Kelly’s Country Store, they are known for having the best Santa around, he comes down the chimney and there are real reindeer outside the window. They do a phenomenal job and our friends family grew up with this being a holiday tradition so we decided to start going with them. Ada did not enjoy seeing Santa though. This photo below makes way better Santa memories then her sitting nicely on his lap! I will forever cherish this photo of her meeting Santa for the first time. We had my dad’s fireman holiday party the following weekend and she did much better with him, She made me sit with her this time, which was kinda awkward. My dad got an awesome photo though of her giving him a high five! We had one more holiday party that same day, and went right from one party to the next. Dan’s family has gotten so big that their family party is hosted at the banquet hall his family owns. And since they are too large of a family to get together on Christmas they do it a couple weeks before. It’s always a good time and there are so many kids. 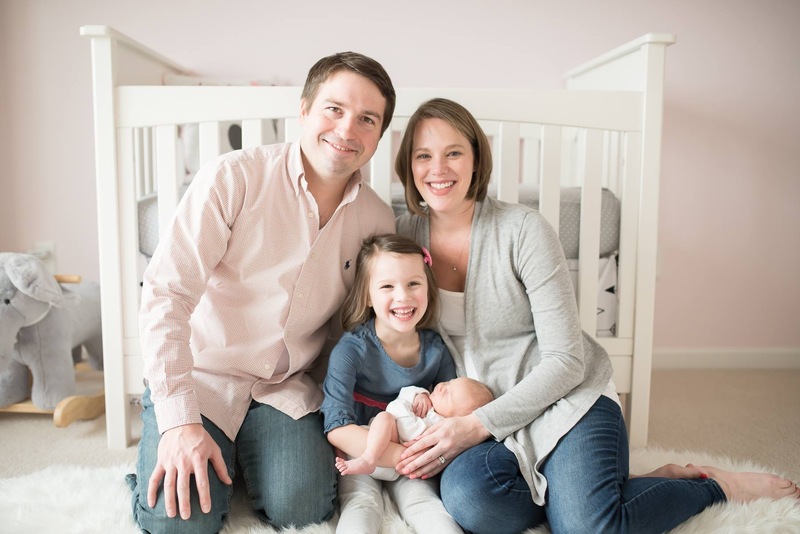 We were able to get a great family photo done too! Like most things this Christmas, she doesn’t quite get anything but is receptive to it. 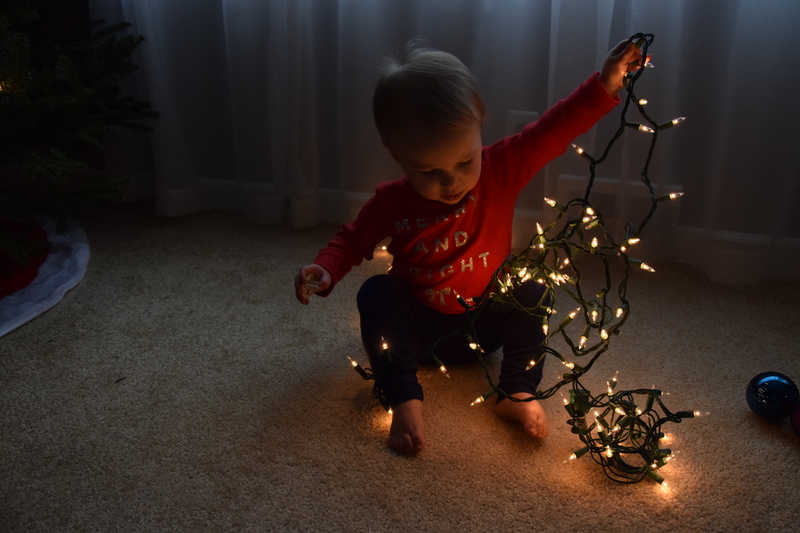 I’m looking forward to the next few years when she is old of enough to really enjoy and understand the magic of Christmas! So far its been a great holiday season! We’ve of course been busy getting ready for Christmas at our house. 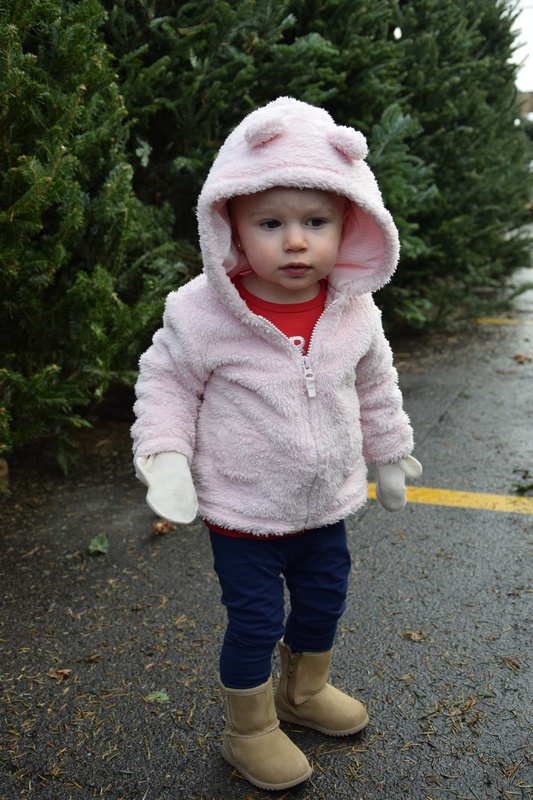 We went and got our tree Sunday after Thanksgiving. 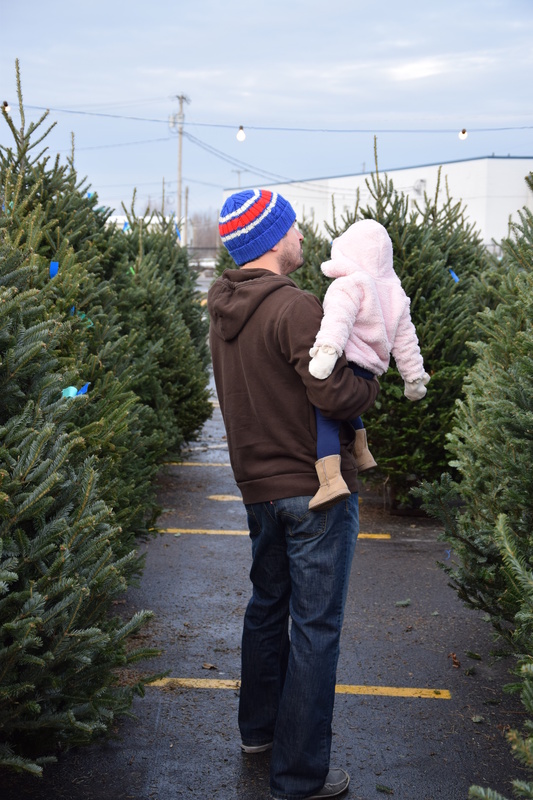 Every year I say I want to go to the Christmas tree farms and cut down our own tree, but since timing or weather never allows for that I’ve settled on just going to a local place and getting one. At least it’s real, which is the best! 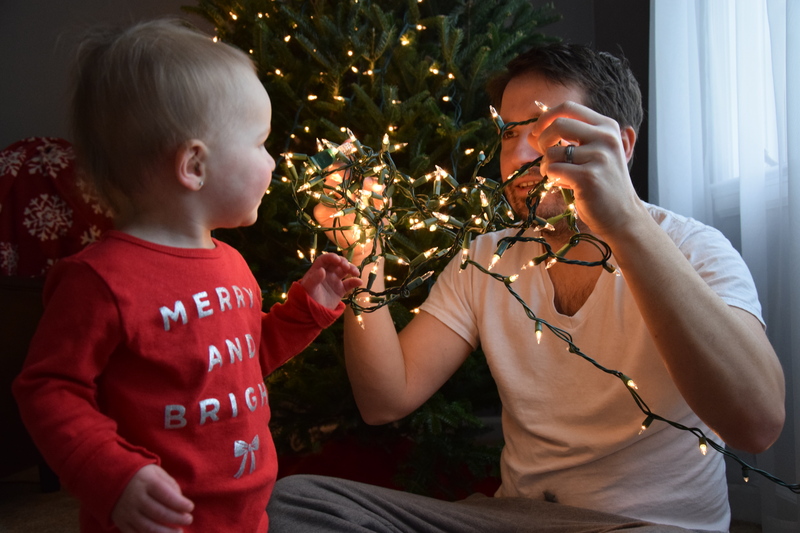 I had to give the tree a few days to fall out, but yesterday we went on a decorating spree, I pulled out all our stuff and while Dan sat on the couch and worked, I put it all together while Ada took it all apart! 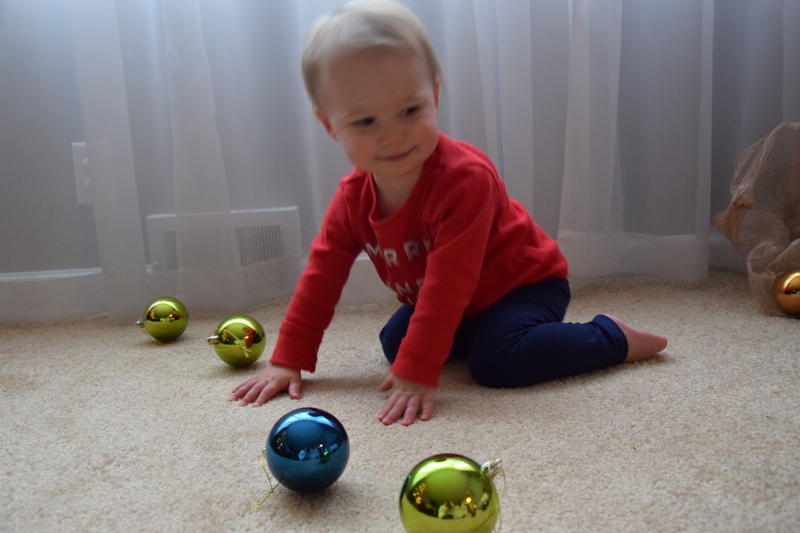 She had fun with all the ornaments and lights though! Ada also had a visit from Boo the Elf last Friday. It’s only been a week, but I think she already gets the whole Elf on the Shelf thing. We didn’t bother with the book because she obviously doesn’t understand the concept of Elf watching her, but she has had fun coming downstairs every day and finding her. I don’t do anything crazy, Boo just moves around every night. I’m not into Elf causing mischief around the house like so many of these intense Pinterest ideas suggest. the point is just for them to watch you and report back to Santa so Elf causing drama and making a mess on my kitchen counters seems counter-productive! I think next year will be even more fun with her! 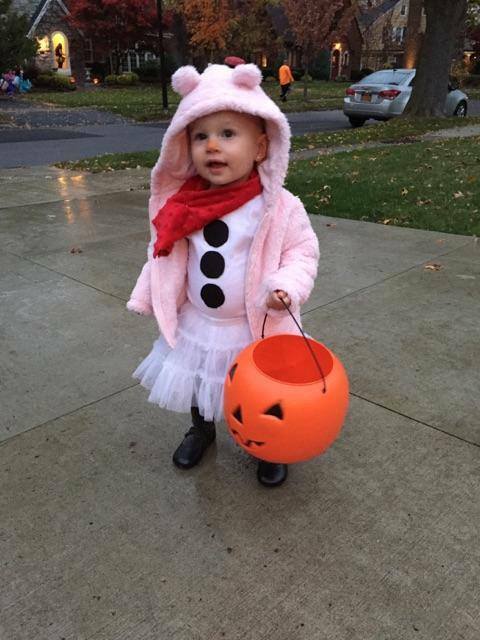 We celebrated Ada’s second Halloween Friday but it was her first time trick-or-treating! 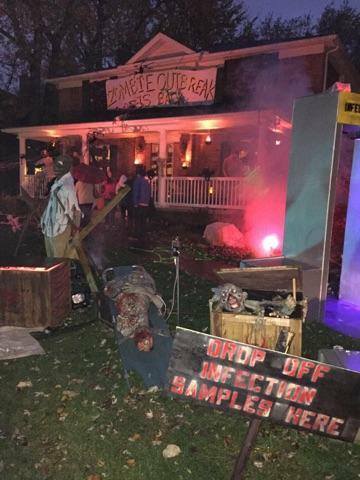 The weather was horrible, it was cold and rainy, luckily she is still so little so we just did a few houses and walked around the corner to check out a neat haunted house display. My sister and her husband Dan came over to hang out with us. They were going to pass out candy for us while we took Little A out trick-or-treating, but we ended up just shutting off our lights for about 15 minutes and all going out. We came back, put Ada to bed and then made some Halloween snacks and drank wine. 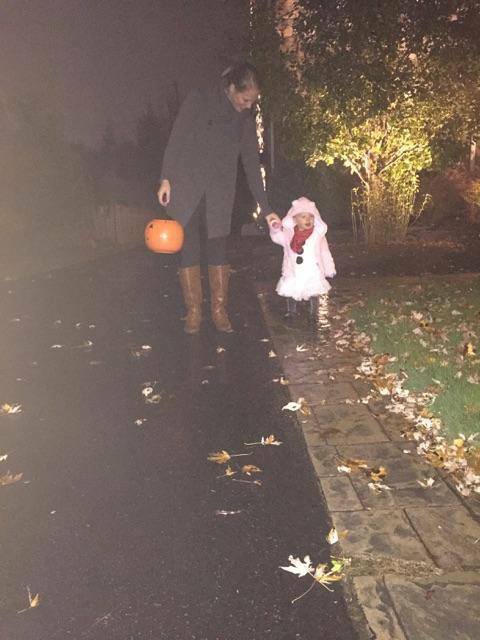 A perfect little Halloween Night! Now we can get ready for Thanksgiving, which is one of my favorites!